Wall Street's latest trade war freakout didn't last long. The Dow erased a 510-point loss on Wednesday and surged back for a gain of 230. Stocked plummeted early in the day after trade tensions escalated between China and the United States. China announced plans for a 25% tariff on $50 billion a year worth of American exports, including planes, cars, soybeans and chemicals. But investors seemed to reconsider, and White House officials cautioned that Wall Street shouldn't overreact to fears of a trade war. Stocks climbed steadily all day after the big early drop. Investors are trying to "weigh the possibility that this is simply a negotiating ploy on both sides," said Sam Stovall, chief investment strategist at CFRA Research. He also warned against drawing conclusions too soon — things may look different at the end of the week. Some investors may have seen an opportunity to buy oversold stocks, said Brad McMillan, chief investment officer for Commonwealth Financial Network. "At this point it's all theater and posturing," he said of the threatened tariffs on both sides. "This is not the oncoming freight train that the market was assuming." No longer fearing an imminent trade war, investors are instead focusing on a promising earnings season, McMillan said. He added that if the political climate leads companies to revise their expectations lower, investors may start selling again. JJ Kinahan, chief market strategist with TD Ameritrade (AMTD), thinks that market volatility will continue until investors hear from CEOs. "I don't think the story's over," he said. The United States has announced its own tariffs to punish China for stealing trade secrets. But the tariffs from both countries remain only threats and plans. It's not clear when they would take effect, and the two countries are still talking. "This is not the start of a trade war. 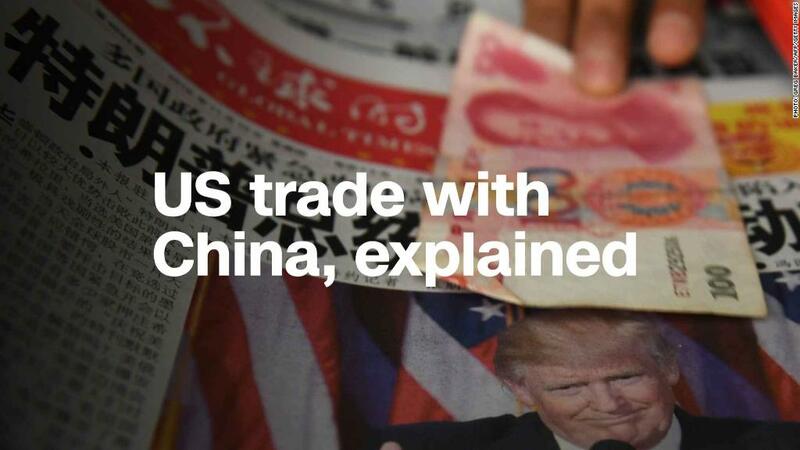 It's the start of negotiations," Vincent Reinhart, chief economist and macro strategist at BNY Mellon AMNA, told Richard Quest on CNNMoney's "Markets Now." Earlier in the day, wary investors sold off industrial giants that depend heavily on China for revenue, including Apple (AAPL), Boeing (BA), Caterpillar (CAT) and Intel (INTC). But the S&P 500 climbed to a gain of 1.1%, and the Nasdaq finished up 1.4%. Investors may have also been comforted when Larry Kudlow, head of President Trump's National Economic Council, said the administration was not angling for a trade war. "I can understand the stock market anxiety. I get that. But don't overreact," Kudlow said on Fox Business. The tariffs, he said, will lead to "better economic growth, more trading going on, improved wages on both sides." "I'm not a fan of tariffs," he said, but added that they are "part of the process." The former CNBC commentator is staunchly in favor of free trade, and he has spoken out against tariffs in the past. He said Wednesday that he supports Trump's decision. Still, investors believe Kudlow will prevent the administration from taking things too far, Stovall said, adding that Kudlow "is likely going to be advising a softer tone." Trump said in a tweet Wednesday morning that "we are not in a trade war with China." China announced its planned tariffs hours after the Trump administration detailed proposed tariffs on about 1,300 Chinese goods, worth about $50 billion annually. The administration said it would hold a public hearing for US businesses next month. "If protecting US intellectual property is the ultimate goal here, I'm not sure how destroying shareholder wealth, damaging CEO confidence and making the American farmer the main sacrificial lamb here after [six] years of pain on the farm is going to get us there," Peter Boockvar, chief investment officer at Bleakley Advisory Group, wrote in a note Wednesday. Despite trade war fears, the economic backdrop remains bright, and corporate earnings are still poised to grow. "The market is going through a self-righting process by working off the excesses of investor enthusiasm. The fundamentals have not changed," Stovall said. — CNNMoney's Ivana Kottasová contributed to this report.